To answer this tired , hashed & rehashed question ; Growth in this hobby , , , just like any other , is 100% , no , strike that , it's 101% dependent on NEW PEOPLE GETTING INVOLVED/INTERESTED !!!!!!!! So what , exactly ARE us existing hobbyists/the AMA/the industry supposed to do to push a hobby onto folks who quite plainly (yes , pun intended) are flat out NOT INTERESTED ?????? Give away free models ? Provide free door to door livery services to the the people and their models to the field ? Maybe build and fly the models for them so they don't get their hands dirty ? THE PUBLIC FLAT OUT AIN'T INTERESTED IN OUR HOBBY !!!!!!! And NO amount of wailing or gnashing of teeth on our part is gonna change that ! The "romanticism" of aviation is gone for "joe Q public" , flying is now as routine as taking a bus , and just like the great electronics kit building hobby of the 1950s and 1960s , I do NOT believe the aeromodeling hobby is ever coming back to it's previous participation levels anymore than the electronics kit building hobby ever will . Are there still electronics kits to be bought ? Sure there are , just as there will always be folks like us who enjoy aeromodeling . But "Boom times" for either hobby's future ? As an informed investor I wouldn't be buying stock in either Horizon or Heathkit ! Now , I implore any one of my fellow RCU AMA forum readers to prove me and my post wrong , I defy you !!!!!!!!!!! My first question would be, growth of the hobby or growth of the AMA. While many would think they are one and the same, they are not. The AMA is foundering. But the hobby? Depending on ones perspective it could be said the hobby has experienced considerable growth in recent years. If you call it an "aeromodeling hobby", then I have to ask, what has the drone craze done to it? Granted, these are not the traditional kits many of us grew up with though some are indeed from kits and scratch assembled. Nor do they have balsa wings or rubber motors or make the screaming sounds of a nitro 2 stroke. But, they do fly. They have added to the over all options for folks to enjoy something that does fly. Even if an individuals main purpose might be to take pictures. Some aspects of the hobby are indeed suffering and may never come back as they were. People "assemble" a plane now and call it scale. Harrumph! Real kits have to now be made by the individual before they can build the model. And the cottage industries come and go as before but seem to go more than they come. The hobby is changing but I don't believe it's ready to lay down and die just yet. The AMA on the other hand missed the boat entirely with the drones. And then had to go and insult some 800,000 so called rogues. Another organization I wouldn't buy stock in. My second question would be, define what you mean by "aeromodeling hobby". Does your definition encompass all aspects of model flight? RC flight? etc. Answer #1 ; Growth of the hobby , period . Not growth of the AMA , not growth of the aspects of the hobby I'm interested in , the raw numbers of people practicing any form of aeromodeling per percentage of the population is smaller today I believe than in years past , and the recent bankruptcy of "Hobbico" (Absorbed by Horizon) is further proof that the numbers just aren't there . When one of the only two big names in the industry fails so spectacularly , the proof of the decline is right there "in your face" as it were . Can you imagine if interest in owning cars fell so far as to see Ford or GM literally disappear overnight ? Think THAT would be indicative of waning public interest ? Answer #2 , I consider the "Aeromodeling hobby" to be anything that flys through the air for fun , without a human pilot on board . That craft can be a model of an airplane , a helicopter , a multicopter , be the method of control R/C C/L or even no control from the ground at all , F/F . As far as I'm concerned it can be a remotely operated model of a hot air balloon , it's still Aeromodeling ! Are you flying it for fun , without actually being on board the aircraft ? If your answer is yes , then it's aeromodeling . Even if an individuals main purpose might be to take pictures. And with this , I couldn't disagree with you more , that individual's hobby would be photography , with the flying camera platform as nothing more than a tool akin to a tripod or telephoto lens . Flight purely for the fun of seeing your unmanned aircraft zip through the air (regardless of aircraft type) ? That's an areomodeler ! Flight for the thrill of taking pictures (A plenty legitimate activity) ? That person is a photographer , NOT to be confused with an Aeromodeler ! #2 based on your answer I would suggest the hobby has grown with the introduction of the drones or MRs as some call them. After all, the FAA reports some 1 million people have registered as recreational drone pilots. Prior to this one could easily have got the impression that the AMAs claimed 200,000 members constituted the majority of hobbyists. So I believe the hobby itself, as you described it, is still viable and even healthy to a point. Granted, it's not the same hobby we grew up with. And many of us will no doubt continue to see our favorite parts of the hobby fade and become more difficult to practice. But maybe what needs to happen is for us to remember what it was like when we first started. And see how we can relate it to today's youth? The hobby will not grow through the AMA. It has to grow at the grass roots level. And that then becomes our job. Us old farts with experience and time. I have 3 neighborhood kids who are learning to build RC models. 2-3 times a week they come over and I help them work on their planes. We acquired plans and laser kits for 3 basic trainers from the 60's and will maiden them all come spring. The kids realize this takes time and I have rules for them, homework, etc. But they are learning and asking questions. One mother usually shows up too and even she is learning and excited by the prospects of all this. Init4fun, although I had reserved myself to not post in the AMA forum for obvious reasons, I do feel I need to stand up and applaud your posts here. IMO you are spot on! My answer to your our question is that when we find someone with that spark we need to cultivate that spark into a flame. That may mean passing some unwanted equipment to somone, donating some time to them, etc. In other words, get out there and get involved. I'm currently in the process of moving from Sacramento Ca to Portland Or. I went to a swap meet on Saturday in the Portland area and was not only surprised by the turn out, but I saw a great deal of young people there as well. When I am there in the new residence permanently, I will take a closer look at the clubs in the area and choose the club that has the most young people and begin to mentor more then I have in the past. It's not earth moving but it is what I am capable of doing. The willing young are of course to be mentored , and I'm happy to hear you have a few that you are helping along in the hobby . Around here such youth seem very few and far between , X Box and Playstation 4 having got most of em . As to the AMA , I am an aeromodeler first and foremost and while I believe an organization such as the AMA is generally good for the hobby* , I will be an aeromodeler till MY death , the death of the AMA will in no way diminish my interest in aeromodeling ! 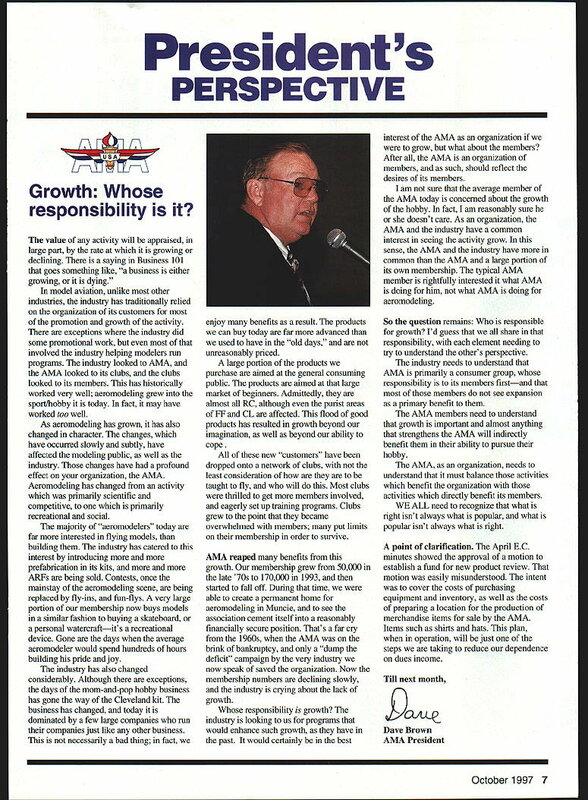 * I say "Generally" because the whole peeing on the drone flyers and attempted forced membership things were most certainly NOT good for the hobby , even though the AMA EC seemed to think shunning the drone flyers and forcing the rest of us to belong to enjoy the "privilege" of flying our models was a smart strategy . I see the AMA has been trying to court the drone flyers as of the past few years , too little too late , as you say being called a "rogue" flyer by the hobby's representing organization likely didn't sit well with them . This post is in response to Appowner , I'll address SpeedRacer in my next post . Thank You for the response SpeedRacer , I appreciate it . I am truly happy (for real) that both you and Appowner have interested youth to mentor . My club does several "come meet the aeromodeling hobby" events each year and as of now I believe the only youth members we have are the children of existing adult members . And yes , the club I belong to not only allows but truly encourages all forms of legal aeromodeling , none of this "drones need not apply" discrimination , and yet it's not like we have new blood coming in year after year . In years past most of the clubs in the area actually had membership caps as there were literally too many to allow everyone some fair air time . Now , I know of no such club with a "closed" membership and I'm lucky to see 3 or 4 flyers anytime I get to the club field . I won't even get started on public fields , I've flown at just about all of them that allow model flying in my area , and I never see anyone else show up , whip out some cool parkie , and enjoy the skies with me . Imagine if fixed wing airplanes were as easy to learn to fly as drones. Think AMA would have somewhere in the neighborhood of 800,000 fixed wing members now? Just a thought. I seriously doubt that. Some of the UMX airplanes are incredibly easy to fly. There are several challenges we need to overcome if our hobby is going to begin to grow once again. IMO we simply so not socialize the same as we used to. It is rare to see kids outside playing like we once used to. For me the hobby is as just as much social as it is the flying itself. Then again I have always been a club sort of guy, most AMA members are the same. As we evolve more into an introvert society then activities such as these will continue to suffer. I've had quite a few people who bought those easy to fly planes like UMX and they practiced on a simulator for many, many hours, yet when they finally came to me for help, they proved that all that practice on a sim was worst than those who had no previous RC flying experience. Those who tried to teach themselves with UMX and other easy to fly planes quickly learned it didn't help with disorientation. Many crashed right away. If you consider those 1 million people, "hobbyists", please explain why the VAST, OVERWHELMING majority of them DID NOT join the AMA? I mean, the AMA is the PREMIER group of model aviation enthusiasts, is it not? From what I have seen in local parks, most kids have no idea that the AMA even exists. How to change this, I don't know. You can't really expect retailers to say "you can't buy this without an AMA card". I'll direct kids I see to the local club, but none ever show up. That said, it's nice to see an informative and civil post in this forum. Okay guys, here's a first. I'm actually going to agree with Speed on something, which I will get to in a minute. A year or so ago, the wife and I stopped for lunch in a local restaurant south of Seattle. While the food was good and the restaurant staff did a good job, it was another group that arrived soon after we did that really caught our interest. This group, of roughly a dozen people of all ages, was led to a long table close to where the wife and I were sitting, no big deal. They all looked at their menus which was, again, no big deal. They all placed their order with the waitress, who then headed away to place the orders with the kitchen. So far, everything was normal for a group at a restaurant. At this point, however, everything changed. Every person in that group pulled out a smart phone and started banging away on the keys, sending text after text to who knows where. Not one person said a word after that, not even to the waitress who had brought out their orders. The wife and I were, in a word, stunned by these people. Another customer, on her way out, actually commented about the lack of conversation. One of the older members of the group looked up at her, for less than a second, and went back to texting. Less than half an hour after getting their food, the group had finished eating and, still banging away on their phones, got up and left. The conversation around the dining room quickly switched to talking about this group. We all knew they could speak, as well as hear, since they had all interacted with the waitress until after she had taken their orders. One person referred to the group mas "Binars", after a race of characters from the TV series Star Trek, The Next Generation. The Binars, quickly explained, are a race that had integrated themselves with electronics, becoming what amounted to a form of cyborg. This is where Speed and I agree on something. Many people, like this group of diners, have become very introverted in how they live their lives. Conversation, as it's always been known, has been replaced by sterile texting, taking out any emotion and personal interaction. The closest thing to a true tonal change, showing an emotional response, is the use of a smiley face of some sort. Not having to be face to face or, for that matter, even having to talk to one another is a way to protect one's self from any sort of confrontation. That has me wondering, what would happen if the cell towers all failed in an area? In the story about the Binars, their main computer went down due to a solar flair, requiring the assistance of humans to save their race from dying. Could this same fate be awaiting us in the not so distant future? A society of introverts that won't know how to communicate without their smart phones trying to work together to repair or rebuild society from some sort of electronic meltdown? In short, they see no value in it for them to join. IF they knew the AMA existed to begin with. As has been said here and elsewhere by many people many times in many ways. And IMHO the AMA is far from being a premier group. About the only claim to fame I see is they're the only such group. Especially since all the current Drone related groups are for Profit. Last edited by Appowner; 03-12-2019 at 04:13 AM. I have to agree with speedracer and hydro, group activities, clubs, social interaction, actual real physical face to face social interaction simply isn't done much these days. One of the main benefits to me of being an AMA member is being a part of my club and enjoying conversation and interaction with some of my fellow modelers along with short trips to nearby clubs and events and fly-ins to see the variety of different models people are flying. Oh I enjoy flying a small park flyer in an open space by myself but it isn't nearly as much fun as being part of a group of like minded enthusiasts. Someone with no desire for social interaction really does have very little reason for being a member of the AMA. It's kind of sad really. One indication of an increasingly introverted society, in my opinion, is how people will hang back at a stoplight at a multi-lane intersection, just to avoid being looked at by someone in the car that they used to pull up next to. A friend of mine is a police officer. He stopped at a red light and pulled up next to a lady in the other lane talking on her cell phone, which is illegal. He signaled to her to put the phone away. She looked over and ignored the officer. SpeedRacer nailed it with the introvert society , if we were still able to rate posts I'd 5 star that post big time ! If she was that stupid, to ignore a police officer, she deserved to get a ticket. It never ceases to amaze me how stupid and self centered people can be. My Brother-in-law is a retired county Sheriff. You should hear some of his stories. Makes you wonder if there is any intelligent life out there. AMA membership would likely be less than half of what it is.